Marie Antoinette was not only fashionable and the “it-girl”or her time, besides being at Versailles and other castles all the time and having to obey to the “Etiquette” she desired to be able to escape to what she thought was the plain life of a shepherdess. Of course all of the finest ! She had a little hamlet built, in which baby animals were held, farmers and their wifes were installed there to play the role of the lucky land life -much in difference to what the real land life was like in France of this period ! 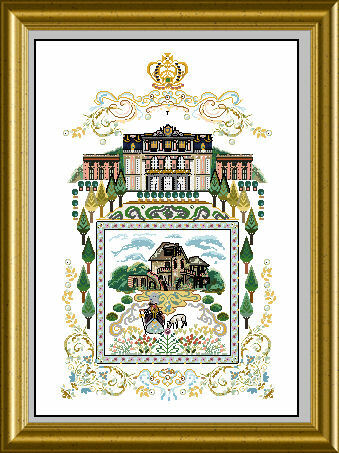 You can now stitch the impressions of this “Hameau” with this embroidery – the center picture is one of an elegant shepherdess in silken attire in front of one of the main buildings of this tiny hamlet inmidst Versailles. At the upper border you see the Petit Trianon, wich was Marie Antoinettes retreat to be as alone as one could be there…. 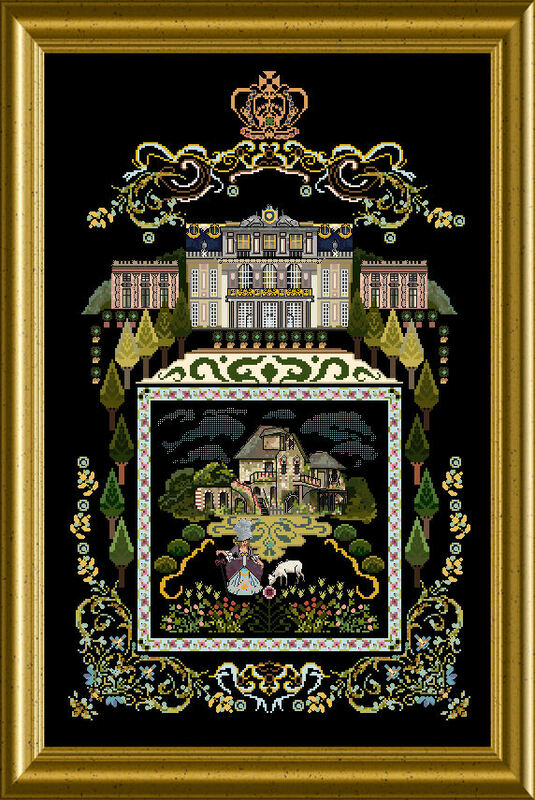 surrounded with elegant scrolls and beads, you stitch a piece which transports a bit of the elegance of these times. Of course you will use interesting threads of silk and cotton, beads and crystals and golden metallics….and stitch beautiful Special Stitches besides the normal cross stitch. 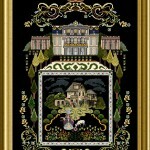 The mere design size is 215 x 347 stitches.